Scientific WorkPlace, Scientific Word and Scientific Notebook by MacKichan Software, Inc. is a series of software for composing and publishing mathematical, scientific and technical documents. While statistical software is imperative for quantitative and qualitative data analysis, being able to produce high quality typeset text to showcase the results is very important. To help instructors and researchers with this task, MacKichan Software just released version 6 of its three software: Scientific WorkPlace, Scientific Word and Scientific Notebook. Version 6 offers a choice of operating system: Windows or OSX and also allows saving and exporting documents in multiple formats taking advantage of a new Mozilla-based architecture. A new look with streamlined layouts for the toolbars and symbol panels allows the users to easily navigate through the commands. Version 6 maintains the front-end side of the software to LaTeX saving the time and efforts for users to learn the syntax of LaTeX. The new version offers extensive document production features including importing files from earlier versions, multiple document production options, preview and print directly from the program window, improved and scalable fonts with support of left-to-right and right-to-left languages. Version 6 allows users to draw 2D and 3D plots with plenty of options to enhance and animate the graphs. Scientific word processing products all share the same easy-to-learn, easy-to-use scientific word processor. You use natural mathematical notation to enter and edit mathematics in the same environment as text. 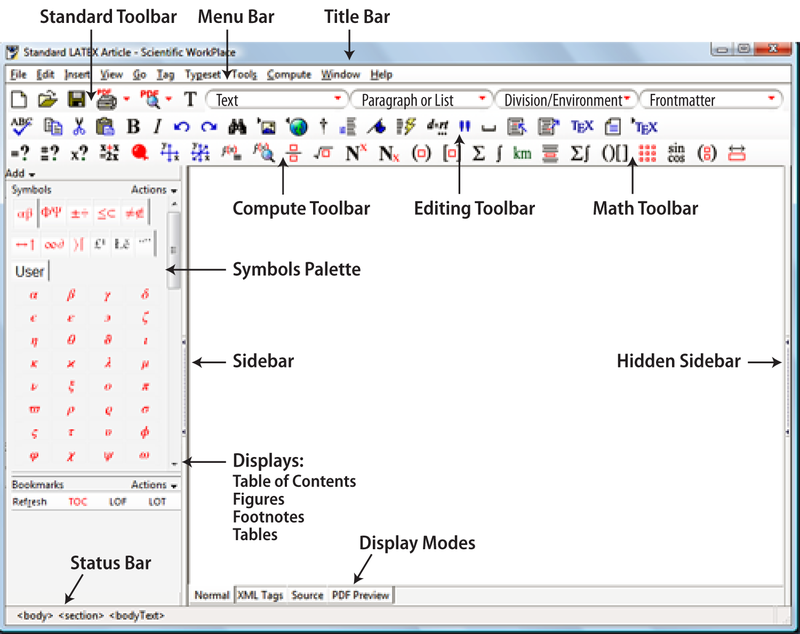 Convenient, configurable editing and symbol toolbars simplify your work. And you can quickly learn to enter equations, create tables and matrices, import graphics, and perform a standard array of document-based tasks. These word processing products export directly to HTML, with mathematics exported as graphics or as MathML. Publishing mathematical documents on the Internet has never been so easy. Scientific WorkPlace and Scientific Word use LaTeX, the industry standard for mathematics typesetting, to produce beautiful mathematical documents. When you typeset your documents, LaTeX automatically generates tables of contents, footnotes, indexes, bibliographies, and cross-references. Scientific WorkPlace and Scientific Word simplify the production of journal articles, books, and other large documents. Scientific WorkPlace and Scientific Notebook add the MuPAD® computer algebra engine for symbolic and numeric computation. The mathematical expressions you create are live. With just a mouse click, you can evaluate, simplify, solve, and plot mathematical expressions right in your document. No complex syntax is necessary. Use the built-in Exam Builder to construct exams and course materials algorithmically, and generate, grade, and record quiz results on a web server. Scientific WorkPlace and Scientific Notebook are ideal for long distance learning and classroom instruction, and for writing reports, research papers and homework. With Scientific WorkPlace, Scientific Word, and Scientific Notebook you can enter mathematics easily with the mouse or, as you gain confidence and familiarity, with keyboard shortcuts. In Scientific WorkPlace and Scientific Word you can choose to typeset complex technical documents with LaTeX, the industry standard for mathematics typesetting. Because of its precision and quality, publishers and writers of scientific material use LaTeX extensively. When you typeset, LaTeX automatically generates footnotes, indexes, bibliographies, tables of contents, and cross-references. This typesetting power comes without you having to learn LaTeX. Scientific WorkPlace and Word automatically saves your documents as LaTeX files. A computer algebra system, or CAS, is a mathematics engine that performs the symbolic computations fundamental to algebra, trigonometry, and calculus. Recent versions of Scientific WorkPlace and Scientific Notebook include the kernel to the computer algebra system MuPAD. With MuPAD, you can evaluate, factor, combine, expand, and simplify terms and expressions that contain integers, fractions, and real and complex numbers, as required in simple arithmetic and algebra. You can also evaluate integrals and derivatives, perform matrix and vector operations, find standard deviations, and perform many other more complex computations involved in calculus, linear algebra, differential equations, and statistics. Additionally, you can create 2D and 3D plots of polynomials, trigonometric functions, and exponentials, and you can create animated 2D and 3D plots and explore them with the MuPAD VCAM window. Student versions of all three products are available at greatly reduced prices and fulll functionality.